The Derby de la Meije is 31 years old... It s a unique international event that brings together over 1000 racers for 3 days for a big mountain race. 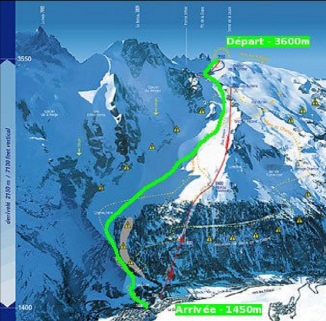 The derby is also a way to discover the mountains, its risks and all necessary means to ski safely. It s also a music festival and entertainments for gliders coming from all over the worlds. The 31 th edition will take place from 3 avril 2019 to 5 avril 2019 - in La Grave la Meije in the Hautes-Alpes. After existing for 31 years, its success is well known and the Derby moves onwards while being La fête de la glisse (the slide party ) in an exceptional ambiance ! The Derby is open to the Youngs aged 16 and over. Leaving from the dome de la Lauze at 3550m to get to the finish line the fastest possible way. Ski, mono ski, telemark, snowboard or all other sliding devices are accepted. No gate or imposed itinerary and just a few mandatory passages and some forbidden areas for security reasons. It s given by waves of 10 riders every minute and all types combined. A team is composed of 3 people with al least one women racing on 3 differents devices. The team time is calculated by adding the 3 individuals times. To be ranked, you must enroll individually (with the gliding device of your choice) or by team. An individual ranking and by discipline is also made. The best do it in less than 10 minutes, and the least in a hurry in over an hour.